Unfortunately far from common in most parts of Britain and Ireland, Agaricus augustus is one of the very finest of edible fungi (indeed, truly deserving of the title Prince of Mushrooms! ); it usually appears in small groups in open woodland or beneath parkland trees, particularly conifers. 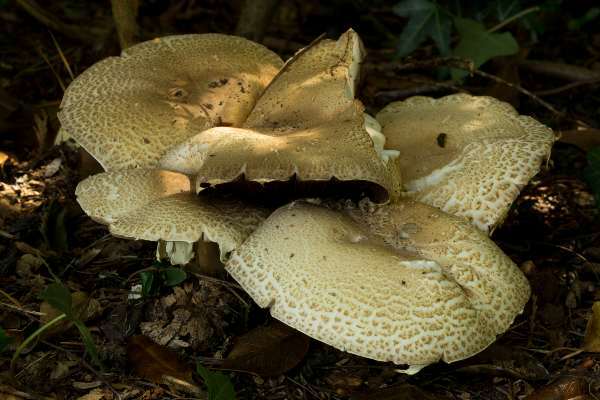 The Prince is exceptional among woodland mushrooms in being instantly recognisable from a distance; however, if you are ever in any doubt its bitter-almond odour provides additional assurance. A widespread but occasional find, in Britain and Ireland The Prince often fruits in small groups. 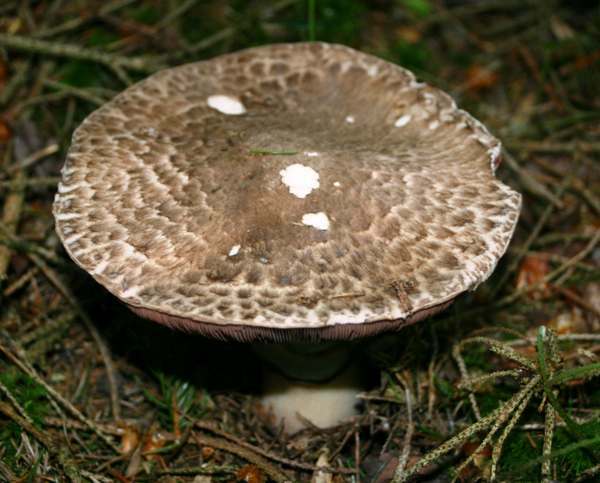 Agaricus augustus occurs throughout mainland Europe and in Asia, northern Africa and many parts of North America; it has been introduced into Australia. 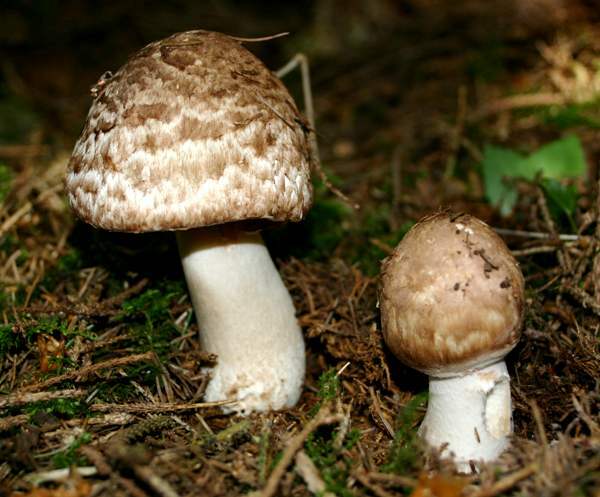 Agaricus augustus was first named and described in 1838 by the Swedish botanist/mycologist Elias Magnus Fries, and the name has remained unchanged to this day. The specific epithet augustus is thought by some to be a reference to the month of August, when this mushroom is likely to be found. I have indeed found Agaricus augustus in Sweden during August; however, it first appears rather earlier here in West Wales where I now live - often in July. A literal translation of the Latin augustus is 'noble', and I rather favour that interpretation... the Noble Prince seems most apt! 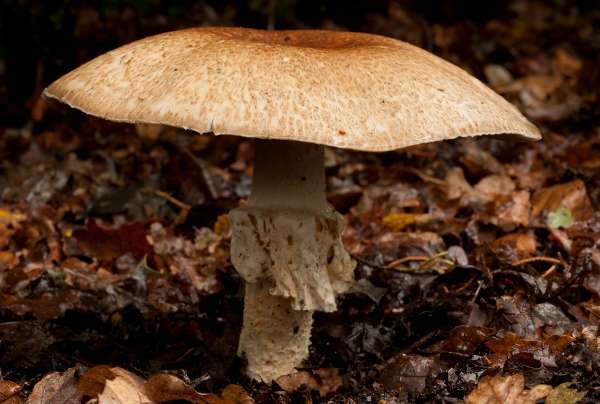 The mature Prince mushroom shown above was photographed in southern England by David Kelly, with whose kind permission this picture is shown here. 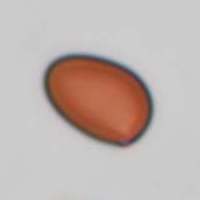 I have found no reports of people becoming ill as a result of eating this species, although the usual precautions are advisable when trying this or any other mushroom for the first time: start with a small portion to make sure that your body is not intolerant of this partcular species. When fully expanded, caps of Agaricus augustus can attain a diameter of 25cm and occasionally more, but as these prized edible mushrooms are prone to maggot attack it is usually best to gather any you intend eating when their caps are young and still expanding. 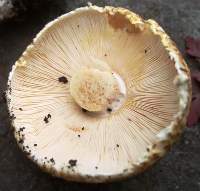 The flesh has a firmer and more pleasant texture when the caps are only partly expanded. Provided that you check all of its identification features, Agaricus augustus is one of the easiest of the gilled edible fungi to identify with confidence; it is also a big mushroom, and so one substantial specimen is quite sufficient to make a meal fit for a prince. What a pity that these superb mushrooms don't occur in more places and in greater abundance! Use The Prince in any menu calling for button mushrooms and you are certain to notice a big difference in flavour. You will also find when you are cooking them that the 'almond' scent of Agaricus augustus is quite different from the usual mushroomy small of supermarket-bought Portobello Mushrooms, Chestnot Mushrooms, etc, all of which are cultivated forms of Agaricus bisporus. The Prince has caps 10 to 25cm across (exceptionally 30cm) at maturity; initially hemispherical, becoming broadly convex and sometimes flattening completely; the cream surface is covered in large reddish-brown scales, increasingly dense towards the centre. Free; pale pink, turning very dark purple-brown with age. Stems of Agaricus augustus are 10 to 20cm long and 2 to 4cm diameter and have a large pendulous white ring; the white surface of the stem is smooth above the ring and has small woolly scales below. Ellipsoidal, smooth, 7-10 x 4.5-6.5μm. 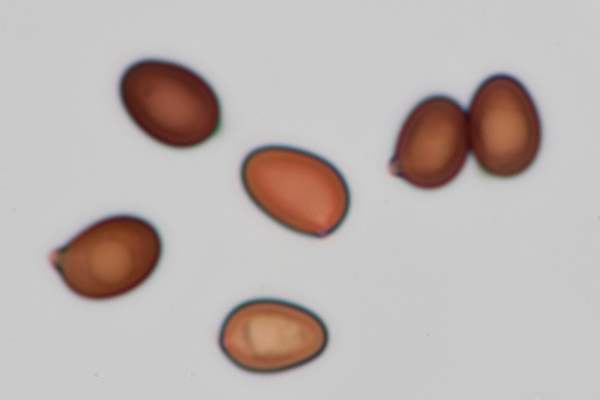 Fresh young fruitbodies smell strongly of bitter almonds. Saprobic, in open woodland or on woodland edges and occasionally beneath trees in parks and gardens, particularly with conifers. Agaricus bernardii is slightly smaller; it occurs in coastal dune slacks. The Prince is a highly-prized edible species and can be used in any recipe calling for large cultivated (Portobello) mushrooms. It is great in rissotto dishes and omelettes, and it certainly has more than enough flavour to make tasty soups or sauces to be served with meat dishes. The genus Agaricus in Britain, 3rd Edition, self-published, Geoffrey Kibby 2011. This page includes pictures kindly contributed by David Kelly and Tom Pearman.